Unless you’ve been living under a rock, you know that minimalist pocket multi-tools are a smokin’ hot thing right now. EDC nerds get into heated arguments about card vs. keychain tools, weight, features, brands, etc. And to be fair, these little things are really cool. It’s amazing how much you can do with a flat piece of metal. I’ve carried the NiteIze one on my keychain for years, and it’s a handy little device. 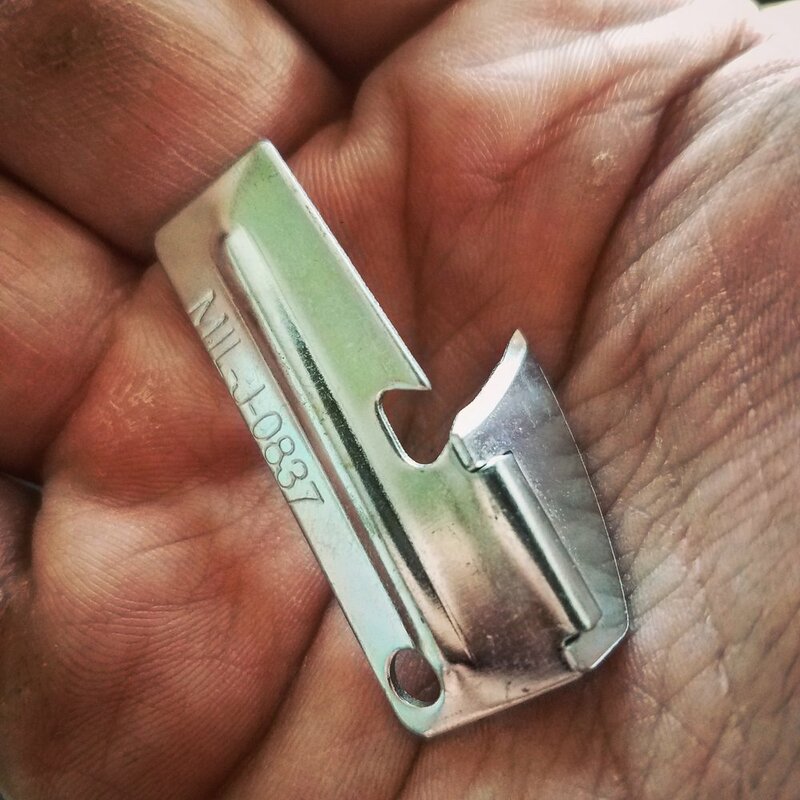 I use mine mostly as a bottle opener (let’s be honest, you probably do too), but it’s been a lifesaver on many an occasion. But the idea is not new. In fact, today we’re going to talk about the granddaddy of all pocket multi-tools, and one that still puts most of todays’ offerings to shame. We’re talking, of course, about the legendary P-38 can opener. If you’re not clued in, you may have wondered why crusty old veterans from the pre-MRE era are so obsessed with the P-38. And I wondered too, until I figured out just why they’re so cool. It reminded me that when cranky old Vietnam vets give you gear advice, you should listen. The P-38 was invented in the heat of World War II, when the Army realized that the canned GI C-Rations needed a better can opener. It was brought from idea to production in less than 30 days, which is lightspeed by government standards. Every C-ration from then on contained a single P-38. As a result, every GI had dozens of these things floating around, and they came up with some pretty ingenious uses for them. They were intended as one time use disposable items, but they last forever. They are virtually indestructible, and never need sharpening. It’s a brilliantly simple design executed perfectly. The P-38 stopped being issued when the military phased out the C-ration in favor of MREs in the early 1980s, but soldiers and marines didn’t stop loving them any less because of it, and their utility has far outlasted their original purpose. And much more. It’s indestructible, and virtually weightless. It’s also dirt cheap. Sportsman’s Guide has a can full of them (which, ironically, needs a can opener) for $24.99. Surplus stores like the Military Depot have them individually for less than a dollar. There’s absolutely no excuse not to have one in every kit you own, and if you’re building a kit on a budget, they’re hard to beat. I still have my dad’s Vietnam-era P-38 for sentimental reasons, but the new ones look and perform just the same. While it may not have the flash and glamor of the new pocket tools, and it takes a little more skill and ingenuity to use, the P-38 is still every bit as good. What about you? Were you issued a P-38? Do you carry one today? What other uses for it did we miss? Tell us in the comments!